who are all beloved and adored by children around the world, such as"
too much more. However, The classical princesses stories still the most popular and beloved for all ages. We all still enjoy the story of Snow-white, Cinderella....etc. "Snow White and the Seven Dwarfs" was produced by Walt Disney Production in1937. The story is about a beautiful young princess escaped to the forest from her step mother that was jealous. Snow-white found the Seven Dwarfs' house and by the time she became a part of their life. The step mother pretended that she's an old woman and persuaded Snow-white to bite a poisoned apple. Finally the prince who really loved Snow-white saved her life. This film "Cinderella" was produced in 1950 . And its story is about a kindhearted girl, Her step mother treated her so bad and made her a poor bad dressed servant. The king made a ball to find a bride for the crown prince. The step mother and her two ugly daughters will attend, But they prevented Cinderella from going. The good fairy appears and helps Cinderella, But there is one rule, Cinderella must leave the ball before midnight. The crown prince fall in love with Cinderella. The clock is ticking, It's midnight. Cindrella runs away and forgets her shoe, soldiers look everywhere for the girl. Finally, The duke find Cinderella with the other shoe and the prince marry her. Walt Disney produced the film in 1991.
beast, And his only hope is to earn a young woman's heart. "Belle" the kind daughter offered to replace her father who was a prisoner at the beast's castle. The beast learned not to be selfish nor arrogant any more. to his normal as the beast could earn Belle's heart. 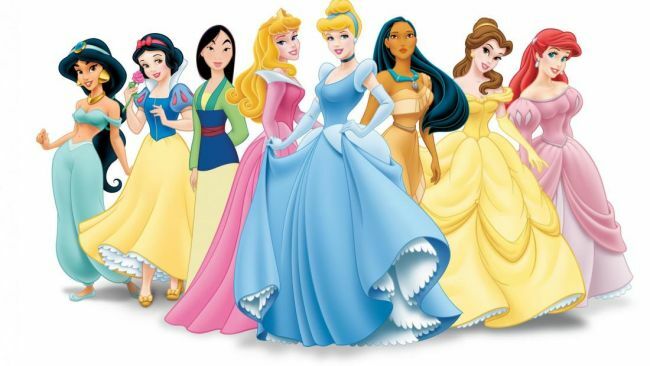 The official Disney Princesses have a number of things in common. 1-The character is human, or human-like as in the case of Ariel and Tinkerbell. 2-The character has either been born royal, married royal, or has performed an act of heroism. 3- The Princesses show good will towards all creatures, evidenced by the common ability to communicate with animals. 4-The Princesses are known for their inner and outer beauty, as well as having beautiful singing voices. Secondly, It learns children that those who are nice with all creatures are beloved and learns them that evil never wins. Most or maybe all of those films have a love story and perhaps some kisses too and of course that's not good for children.